It's 15:30 in Webster, USA right now. 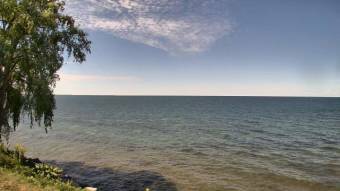 Forest Lawn Beach on Lake Ontario A webcam in Webster, New York - camera location: Forest Lawn Beach on Lake Ontario. Webster, New York: Webster F.D. Station 1, 0 miles away. Fairport, New York: Weathercam, 7.9 miles away. Pittsford, New York: Pittsford Sutherland High School, 9.4 miles away. Pittsford, New York: CinchLink Webcam, 9.4 miles away. Pittsford, New York: Weathercam, 9.4 miles away. Rochester, New York: Charlotte-Genesee Lighthouse, 9.6 miles away. Rochester, New York: West Irondequoit Central SD, 9.6 miles away. Rochester, New York: ROC Terminal, 9.6 miles away.